Fairfax House is mounting a campaign that will see the largest transformation to the interiors of this Georgian Townhouse since its restoration was completed 35 years ago. Our aim is to reveal a world without electric light and life in a Georgian townhouse after dark. This exciting project will ultimately reinstate ‘candle’ fittings throughout Fairfax House, illuminating the effects of candlepower and the way lighting was approached in the 18th century. The project has in part been prompted by the recent acquisition and reunion of an exquisite rosewood candlestand, matching one that has been in The Noel Terry Collection since the 1940s. These beautiful pieces and examples of fine craftsmanship would have been surmounted by equally elegant candlesticks. We have the opportunity to secure a pair of two such candlesticks. 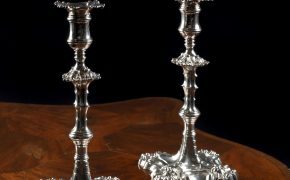 Made by important London silversmith, William Grundy in 1761, these weighty and exquisitely cast candlesticks correspond perfectly with the production date of the candlestands. Their quality, design and proportion could not be more fitting to grace the pair of rosewood stands nor better enhance the way in which lighting in a Georgian townhouse is understood. However, this is just the starting point for the project and we wish to aim for something much more ambitious and visually powerful in terms of how we present the townhouse. At present the house relies on a combination of modern table lamps, uplighters and basic fittings to bring all important light into the period spaces. Yet these intrude into our perception of a period mid-eighteenth century space, and tell us nothing of the ways in which a house’s inhabitants relied on precious candlepower. Nor of the specially designed and crafted pieces that held candles such as girandoles, wall sconces, candlesticks, candelabra, chamber sticks, chandeliers and lanterns. fittings that it would have boasted and filling a critical gap in the way we currently showcase and understand its beautiful domestic interiors. Imagine the grand central staircase and Venetian window embellished with girandoles, as they would once have been, bringing light and even greater elegance to this architectural masterpiece and processional route. Our goal is to raise a total of £30,000 of which the first £3,500 raised will secure the magnificent Grundy candlesticks. It is a bold aspiration but one which we feel Fairfax House is most deserving of, and until we do, the house is not complete. Two years ago, our supporters helped us achieve an incredible goal and raise the £300,000 we needed to save the King David Panel. This campaign showed the tremendous things that can be achieved and thanks to this support today the King David panel is permanently secured on public display at Fairfax House. We hope that we might ask for such generosity again in raising money to secure the candlesticks to celebrate the reunion of the rosewood candlestands and set us on a path for our larger project. If you would like to support this appeal, cheques can be made to ‘Fairfax House’. Alternatively you can donate securely online via BT’s MyDonate by following the link below. If you can help us with Gift Aid, it will make your donation go even further.